« Why put cycling last? Participants in Edinburgh. Photo Suzanne Forup. 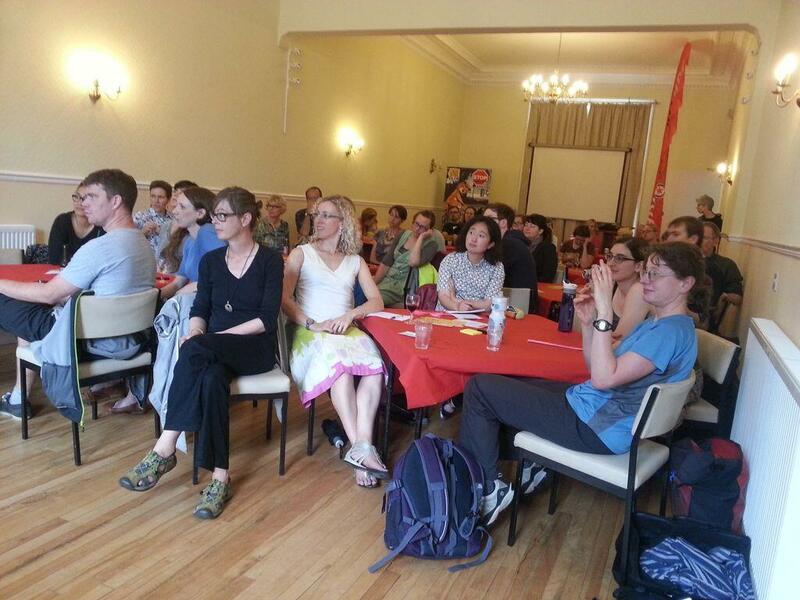 I participated in the excellent and popular Women’s Cycle Forum in Edinburgh – apparently the first such event in the UK – and will be speaking at a similar type of event in Bristol next week (although Bristol’s women-only, and more focused specifically around gender and cycling). The Edinburgh event (organised by Suzanne Forup and Sally Hinchcliffe) inspired me to think about running one in London as part of the LCC Policy Forum seminar series. Edinburgh was great because it had lots of energy and attracted an interesting group of people who’d been encouraged to come to something they felt was aimed at them, and would give them the chance to contribute to cycling debates. (Not excluding men – this was an open event). I plan to go for a similar format, where there will be a panel of speakers leading off for five minutes each, followed by table discussions. I’ll be asking each speaker to decide in advance a cycling related question or questions she wants her table to answer, which doesn’t have to be anything to do with gender or women (although it can be). Like Edinburgh I hope it’ll be a useful and inspiring exercise for the speakers, who’ll get the chance to hear from a diverse groups of participants (men and women welcome) who can hopefully bring something new to some of our thornier cycling problems. I’m keen to hear suggestions about who might be on the panel – I’ve got some ideas, but any additional leads/suggestions would be very welcome – women from the cycling world, pretty broadly defined (policy? politics? research? campaigning? sport? etc…) and (given lack of travel budget) local-ish to London. You can leave comments or tweet/email me. The second seminar idea may also be a panel/group discussion format, and will involve academics talking about the latest cycling research, from a range of disciplines. Advocates, practitioners, policy-makers and anyone interested in the state of cycling knowledge will be welcome to come, ask questions, and discuss research ideas. What do we need to know about cycling? (And, sometimes more important, what don’t we need to know?) Again suggestions for panel members very welcome, including self-nomination!